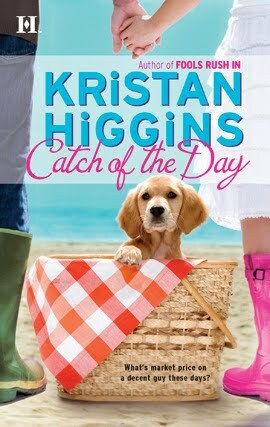 Kristan Higgins amazes me yet again: I read Catch of the Day cover to cover in one sitting. Maggie and Malone make a very…interesting match. Sometimes I kinda felt sorry for Malone, Maggie has one big personality! I really love the way he handled her. And really, its about time Maggie falls for him instead of being a lovesick idiot over a priest! The dude was a major flirt though, he should probably tone that down. Between Maggie tripping all over herself around a man of God, then her crazy interactions with Malone…Kristan Higgins kept me laughing through this entire book. There was also one point when I actually cried a little, Maggie suffered a loss that made me really upset for her. My laughing and crying aside, I didn’t feel quite as connected to this book as I have to a couple of Kristan’s other books, but I definitely loved Catch of the Day by Kristan Higgins and will be re-reading it in the future. Glad you enjoyed it. Do you have All I Ever Wanted? I have a sampler, and have seen some people around the blogoverse talk about it. Maybe I should go and buy a copy. Great review! I have All I ever Wanted . But I am yet to read it. I might go and read it now. This sounds like a great fun read! But since you mention u didnt connect as much as you have with others of her books, which book or series of hers would you recommend a newbie to her writing I start with? I have a bunch of her books sitting on my TBR pile. Is it me or do her books always have the cutest animals on the cover? Sounds like a great contemporary read! 🙂 Glad you've found an author you love over and over again.